"Brock creates a safe and inviting atmosphere where he shares heartfelt and personal experiences. He connects with his audience by inviting questions. His response to these is honest and passionate. Students and staff at Lockerby appreciated his sense of humour and willingness to share his personal struggles. His presentation encourages those present to reflect upon how they interact with each other." "Having Brock as part of our school’s LGBTQ+ day was an incredibly rewarding experience for both staff and students. 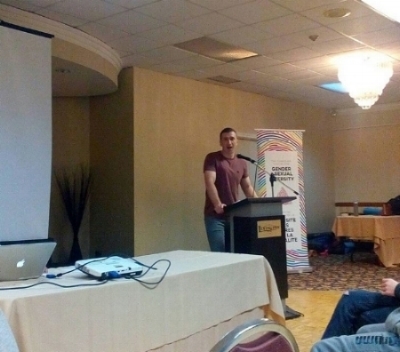 Engaging and interactive, Brock shared his unique experiences in a way that afforded our school community the opportunity to better understand the process of coming out, and living, as a gay athlete. My colleagues and I who arranged for Brock to speak could not have been happier at the way his presentation encouraged critical thinking, sparked discussion, and defied stereotypes – an excellent and worthwhile engagement for all involved!" "The Northern Sports Industry Conference had the pleasure of having Brock McGillis address our delegates during a breakout session… managing to deliver a ‘WOW’ factor! Brock is a passionate and charismatic individual, who is able to convey his story in a way that leaves an impactful message to all listeners. Our delegates left his session with a greater understanding of acceptance." "One of my colleagues had Brock as a student and introduced me to him. Where I study gender and sexuality in ice hockey, I was pleased to make his acquaintance. We also both became involved with the You Can Play Project and are working together on a couple events in the hockey community through the lens of the organization. We frequently have long phone calls during which Brock comes up with a plethora of ideas to make the sporting community a better place for LGBTQ+ athletes. His passion, dedication, and innovativeness are infectious and I always leave our conversations with a renewed sense of determination where both my research and activism are concerned. He’s an integral part of the conversation about inclusion in sport and I commend him for taking on that role."